A gorgeous set, perfect for gifting! This isn’t the first collection of postcards I’ve received/reviewed, but it’s easily the most gorgeous and well-designed set I’ve ever seen. The fifty postcards – which feature paintings by ornithologist David Sibley – are printed on heavy cardstock and have beveled edges, giving them an extra-sophisticated look. They come housed in a handsome, sturdy, multi-layer storage box that you’ll want to hang onto long after you’ve sent the last postcard out into the wild (assuming you can bear to part with them!). It’s got a textured feel to it, kind of like canvas, and the insert’s luxurious gold color complements the beige outer box nicely. And of course several birds grace the exterior of the box as well! Inside, the postcards are divided by type of bird – waterfowl, woodpeckers, wading birds, songbirds, and owls & raptors – and each section is marked by a differently-colored file tab. It rather reminds me of those sets of wildlife cards that were advertised on kid’s tv shows in the ’80s. This is a really upscale set; if you have a birdwatcher in your circle, Sibley: Birds of Land, Sea, and Sky: 50 Postcards would make an excellent birthday gift or stocking stuffer. Maybe throw in a frame or two, because they’re sure to want to keep at least a few of their favorites for their own (the Boreal Owl, anyone?). At the beginning of the spring season, we had four different groups of geese descend upon our pond: three pairs and a trio. 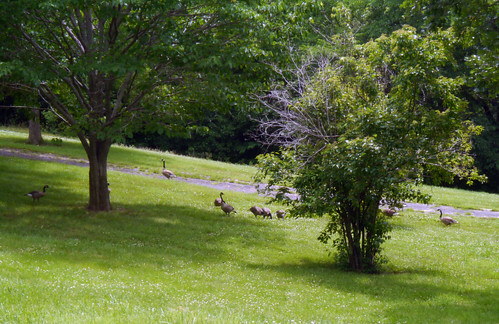 For awhile, it was like an episode of Melrose Place down there, as they defended their different corners of the pond, drove away intruders (including a hapless pair of teeny little ducks who were forever being picked on by all nine geese), and vied for the prime spots. 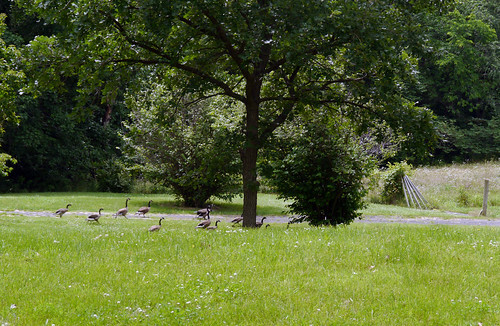 This amount of bird activity isn’t unusual for us (for that, see the great pelican swarm of ’14) – except that all four groups of geese decided to stay, even though only one of the pairs had goslings. 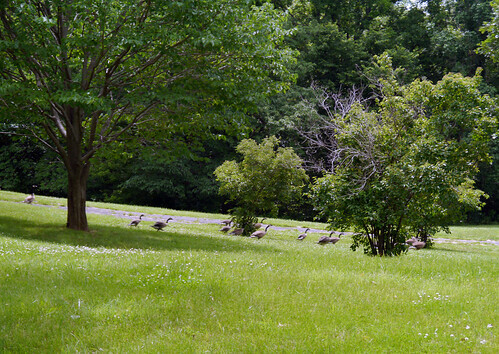 Oddly enough, as spring turned into summer, the four groups seemed to merge into one large flock. Now they’re just one ginormous family of fifteen. 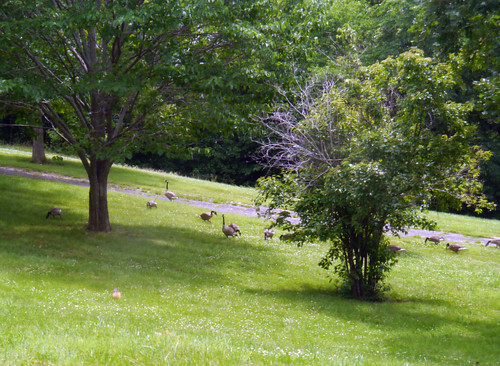 They stay pretty well hidden when they’re in or around the pond, what with all the greenery, but at varying intervals during the day they waddle on up into the front yard to eat. I love to watch ’em, but they’re exceedingly cautious and often flee even if I’m only spying on them from inside the house. The two photos at the top of this post were taken from the bedroom window – not to shabby considering they’re through the window screens. I tried sneaking out the front door for a better shot but they am-scrayed before I could even shut the door. I love Flash Gordon there in the top photo, third from left. Charmingly eclectic and oftentimes macabre, the forty stories found in My Mother She Killed Me, My Father He Ate Me reimagine, remix, and retell well-worn fairy tales from around the globe – including many of your childhood favorites (the Brothers Grimm and Hans Christian Andersen make numerous appearances). Whether you’re a connoisseur of fairy tales like editor/contributor Kate Bernheimer or a newbie whose knowledge of fairy tales comes primarily from Disney films (guilty as charged! ), there’s much to savor in this collection…as long as you come bearing an open mind and a wicked sense of humor, that is! The fairy tales that make up My Mother She Killed Me run the gamut: while some retain their original European Middle Age settings, others are pulled into the present and updated for modern audiences. Some retellings are somewhat faithful and easily recognizable, whereas others are inspired, directly or otherwise, by a number of sources. All are what you might call “adult” in nature – but then weren’t all of the best fairy tales originally intended for mature audiences? Naturally, some of the pieces in this collection are more enjoyable than others – and everyone’s likely to have their own favorites – but nearly all are at least mildly entertaining. 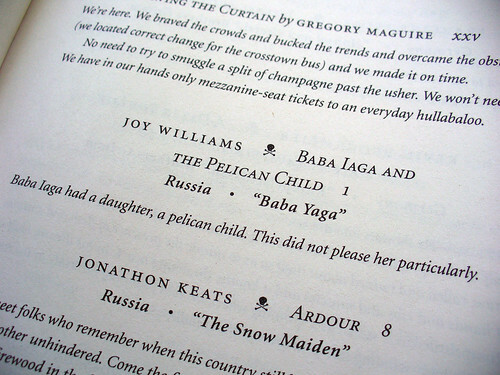 The anthology begins on a strong note with “Baba Iaga and the Pelican Child,” an unexpectedly animal-friendly tale in which author Joy Williams casts John James Audubon (of the Audubon Society fame) as a mass murdering villain. (It’s true! The founder of a wildlife “conservation” society slaughtered free-living birds by the thousands! Not especially shocking, since conservationists consider nonhuman animals “resources” to be harvested or hoarded, depending on the circumstances – as opposed to the sentient, self-interested creatures they really are.) By far my favorite of the bunch, it had me in tears by story’s end. Unfortunately, “Baba Iaga” is the only story I’d describe as espousing an animal-friendly message. Which is fine, really; I didn’t expect this to be a vegan-minded collection. The early “score” just got my hopes up, is all. There’s plenty more to love in My Mother She Killed Me! * “The Wild Swans” (Michael Cunningham) and “Halfway People” (Karen Joy Fowler) – Two tales inspired by Hans Chistian Andersen’s “The Wild Swans” – one, short and sweet; the other, lovely and lingering. * “The Mermaid in the Tree” (Timothy Schaffert) – A young couple’s lives are profoundly changed when the boy, on the eve of proposing to his childhood sweetheart, rescues a mermaid from drowning among the garbage of Mudpuddle Beach. * “Snow White, Rose Red” (Lydia Millet) – A homeless and downtrodden man is saved by two girls, rich and privileged sisters – and is able to return the favor when their abusive father threatens the family. * “What the Conch Shell Sings When the Body is Gone” (Katherine Vaz) – A bittersweet story about loving, aging, and dying, “The Conch Shell” will leave you in tears. And possibly reevaluating some of your life choices. The only story I flat out disliked is “A Bucket of Warm Spit”; the repetitive, heavily accented (even caricatured) language renders it virtually unreadable. Truth be told, I couldn’t get past the second page. Quite possibly, the greater your knowledge of fairy tales – their history, origins, and the like – the more you’ll get more out of this collection. That said, My Mother She Killed Me is suitable for novices too – and just might compel you to go back and read (or reread) some of the originals. I know my wishlist grew by leaps and bounds as I worked my way through the stories! John James Audubon, murderer of children. I started this post on my birthday, but it was shelved shortly thereafter when Jayne, always with the excellent timing, ate my book. $7 and a used copy later, and I’m back in business! So this is pretty cool. The very first piece in My Mother She Killed Me, My Father He Ate Me: Forty New Fairy Tales casts John James Audubon (yes, that John James Audubon) as the story’s villain: the embodiment of evil, Audubon is a mass murderer of birds – and a child-killer, to boot (the titular pelican child is but one of his many countless victims). When I was doing some research for a book on the Florida Keys some twenty years ago, I discovered that John James Audubon, despite his revered status, was a great slaughterer of birds. (Perhaps everyone was aware of this.) He killed tirelessly for pleasurable sport and would wipe out entire mangrove islands of its inhabitants because…well, because I guess it was easy once he got started. I do hope the curse of history will catch up with him. Perhaps Baba Iaga will be the great facilitator in that regard. But she could reach only a few people each day with the lamp. Once, seven people experienced its light but usually it was far less. It would take thousands of years, tens of thousands perhaps, to reach all the human beings with the light. Baba Iaga came home one evening – so tired – and she gathered her little family around her, the pelican child and the dog and the cat and said, My dear ones, I still have magic and power unrealized. Do you wish to become human beings, for some think you are under a hellish spell. Do you want to become human? 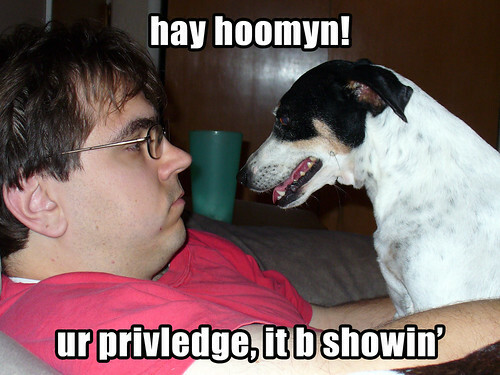 The dog and the cat spoke. The pelican child had not spoken since the day of her return. 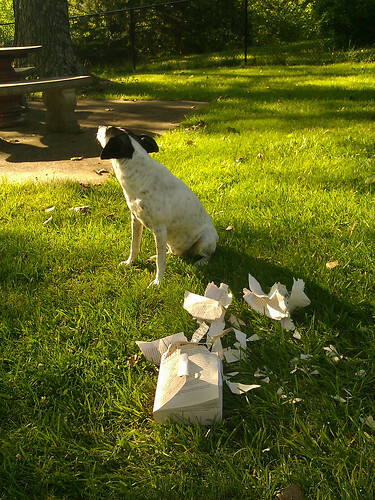 The dog and the cat said – well, I won’t tell you what they said. But I will tell you this: I cried. American Bird Conservancy has produced a new, short video “Trap, Neuter, and Release: Bad for Cats, Disaster for Birds.” Each year, feral and free-roaming cats kill hundreds of millions of our nation’s birds, putting additional pressure on the populations of many species that are in decline. Trap, Neuter, and Release (TNR) programs catch feral cats, neuter them, and then release them back to their colonies, which are subsequently maintained by volunteers. In theory, cat colonies managed under TNR will diminish over time through attrition, and eventually disappear. In practice this is not the case. Though I’m not sufficiently educated on the issue to offer a counter to ABC’s assertions* (except to say that the birds with which ABC is so concerned have no greater right to life than their predators, the domestic and feral cats; but the guardians of domestic cats should most definitely keep them indoors, both for their own safety, and that of wildlife), I have to wonder whether ABC also advocates a vegetarian or vegan diet for Westerners. After all, meat consumption is a major contributor to climate change – which in turn is “the greatest threat to birds and other wildlife in human history.” (So says the Audubon Society, another organization that, inexplicably, engages in omni indulgence, if not outright apologism.) Most likely, ABC stands to save more birds by persuading their fellow Americans to adopt a vegetarian or vegan diet – or even just eating less of the stuff. And also, I’d love to hear Laura “Trap, Neuter and Find a Home” Reynold’s** ideas for rehoming all these feral cats when 1) most are not properly socialized to live indoors, with humans (they’re essentially wild animals, hello! ); and 2) while between six and eight million cats and dogs enter U.S. shelters every year, only half leave alive. Seriously, what a stupid, uninformed thing to say. * Luckily, the HSUS and Alley Cat Allies are. For a rebuttal of ABC’s video, start with their websites. ** Of the Tropical Audubon Society; quoted from an interview in ABC’s video. Just look at those baby blues! Every year going back to 2004, Flickr member lucycat has documented the progress of egg laying and hatching of Eastern Bluebirds in some nest boxes, and it looks like the season is underway! Be sure to check out past year’s captures in her Bluebird Nestboxes collection too. Lucycat currently has three nestboxes set up around her property, each of which may provide shelter for up to four bluebird families every season. The photos are taken on a daily basis, so you can literally watch the newly hatched babies grow from pink little blobs into big, feathery blue birds like mom and dad. Naturally, the grump in me can’t help but wonder whether Lucycat’s audience would also oooh and aaah over newly hatched “broiler” chicks…or whether they’d oooh and aaah over the chicken babies just long enough for them to grow into tasty KCF nuggets, but – well, just go enjoy the photos, and leave the bah-humbuggery to me. Today is National Bird Day! Each year, millions of exotic birds are captured from the wild or produced in captivity for commercial profit or human amusement, only to languish in conditions that fail to meet these animals’ instinctive behavioral and physical needs. As a result, many birds lead miserable lives. National Bird Day (January 5) is a day to appreciate our own native wild birds flying free outside our windows, and a day to reflect on how we treat the native birds of other countries. National Bird Day is also a time to commit to improving the lives of birds in captivity and supporting efforts aimed at protecting birds in the wild. With National Bird Day just around the corner, the Animal Protection Institute (API), in coordination with the Avian Welfare Coalition (AWC), is calling on activists around the U.S. to take action on behalf of captive birds, by drawing attention to the exploitation of birds by the U.S. pet industry. *Nearly 12% of the world’s 9,800 bird species may face extinction within the next century, including nearly one-third of the world’s 330 parrot species. *Many of the world’s parrots and songbirds are threatened with extinction due to pressures from the pet trade and habitat loss. January 5, 2007 will herald the fifth annual celebration of National Bird Day. To commemorate the occasion, the Animal Protection Institute (API), in coordination with the Avian Welfare Coalition (AWC), is calling on activists around the U.S. to take action on behalf of captive birds, by drawing attention to the exploitation of other country’s native birds that is being perpetrated by the U.S. pet industry. Since there are a variety of things you can do to benefit the birds, some of which will take a bit of advanced planning, there seemed like no better time than the present to bring your attention toward this upcoming occasion and stress the need to take action on behalf of the birds. You can help the birds and celebrate National Bird Day in many ways. Click here to find out more. 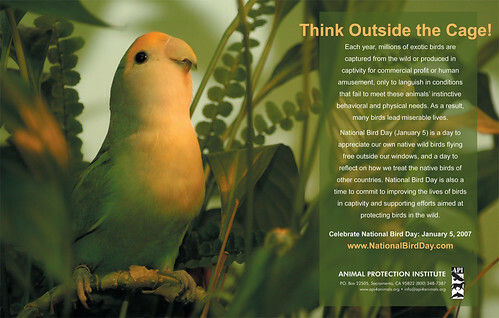 Free 2007 National Bird Day Posters Available to Activists! Thanks for Flocking Together to Help the Birds! My mostest favoritist poster below the jump. You may be aware of our nation’s dog and cat overpopulation crisis, but did you know that birds face the same problem? Just as puppy mills churn out dogs for unscrupulous pet stores to sell, huge commercial bird operations house birds and remove their offspring by the thousands in order to sell them to stores like PetSmart. In homes throughout the United States, an estimated 40 million birds are kept caged and captive—lonely, bored, and a long way from their magnificent homes. Please, never buy a bird. Take a moment to fill out this form and ask PetSmart to stop selling birds.